Our range of swimwear is specifically designed for faecal incontinence, yet looks like regular swimwear. To ensure a secure fit, they benefit from elasticated waist bands. 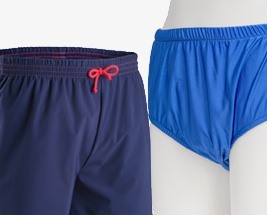 We offer traditional style swim shorts however, if you would prefer to wear your own swimwear, we also stock containment briefs that may be worn underneath.